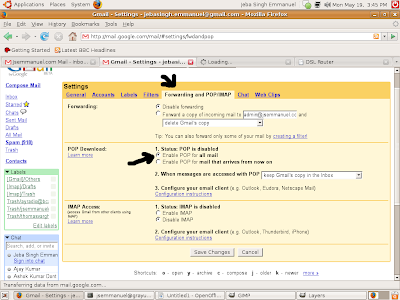 Many of my users have been requesting me to provide a guide on how to download mail over there dialup connections from gmail through pop3. Even if you are not using dialup, but would like to have an offline copy of your mail in case your internet connection gets flaky, or if you internet connection is slow and you would not wish to wait eternally for pages to load, this tutorial might be of interest to you. 1. 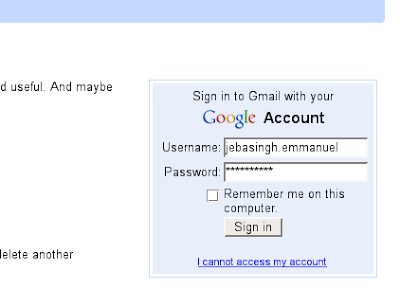 Keep your Gmail user id and password ready. 3. If you are not signed in already, you will be asked for your user id and password. Enter the details in the appropriate fields and sign in by clicking on the ‘Sign In’ Button. 4. 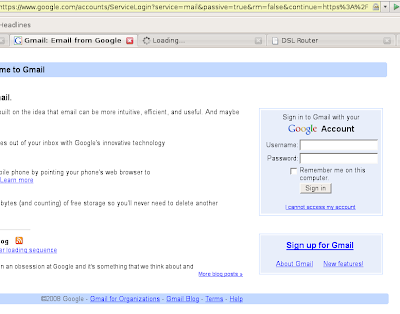 You will now be signed into the Gmail Web Interface. 5. Click on the ‘Settings’ Link on the top right and you will be taken to the Settings page. 6. Click on the ‘Forwarding and POP/IMAP’ tab at the top of the settings page and Enable POP3 Access. You have two options. 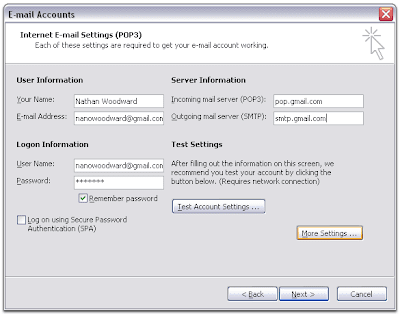 You can either enable POP3 access for all mail that you have ever received or enable only for mail that you receive after enabling. If you enable for the first option, and you already have a lot of mail in your account, it will take some time to download all the mail. 2. Click the Tools menu, and select E-mail Accounts. 3. Click Add a new e-mail account, and click Next. 4. Choose POP3 as your server type by clicking the radio button, and click Next. 6. Click More Settings… and then click the Outgoing Server tab. 7. 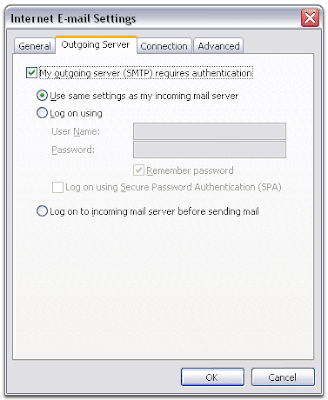 Check the box next to My outgoing server (SMTP) requires authentication and select Use same settings as my incoming mail server. 8. Click the Advanced tab, and check the box next to This server requires an encrypted connection (SSL) under Incoming Server (POP3). 9. 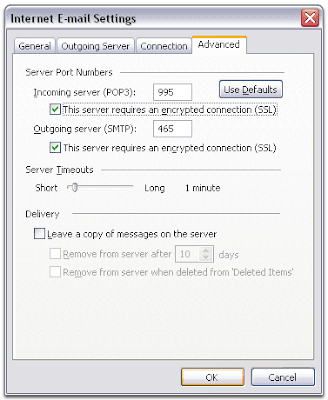 Check the box next to This server requires an encrypted connection (SSL) under Outgoing Server (SMTP), and enter 465 in the Outgoing server (SMTP) box. 11. Click Test Account Settings… After receiving Congratulations! All tests completed successfully, click Close. 13. Download the latest updates for Outlook from Microsoft. 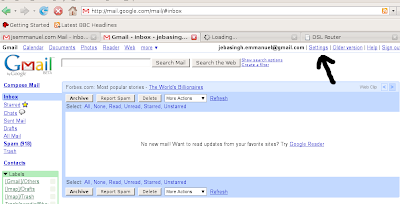 This will help prevent the most common Outlook errors Gmail users see. For this visit http://office.microsoft.com/officeupdates or email the Delhi Regional Office for receiving Outlook 2003 updates in a CD. Apparently Open Office on Hardy Heron doesn’t come with Spell Check support out of the box. To enable it, you need to follow the following steps. 1. 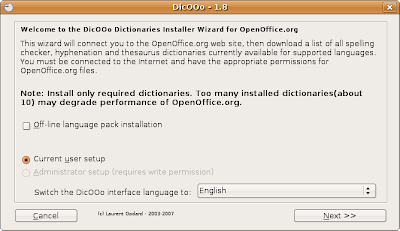 Open up Open Office Writer and goto the menu item “Install New Dictionaries” in File>Wizards. 5. Click ‘Next’ Once and in the next screen, click on the button “Retrieve the List”. 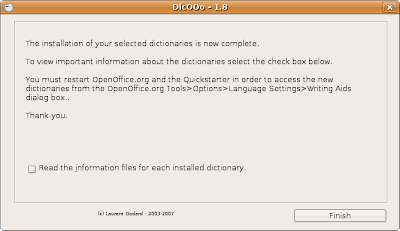 Open Office will connect to the dictionaries server and retrieve a list of dictionaries available. 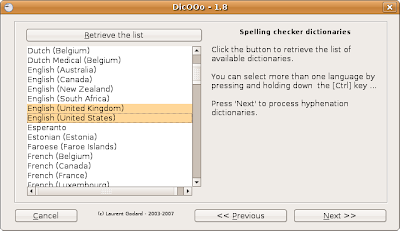 You are serially allowed to select the needed a) Spell Checker dictionaries in the first windows, b) The Hyphenation Dictionaries in the next window and finally the c) Thesarus Dictionaries. 6. Click Next Once while it downloads and displays information on the files to be installed. 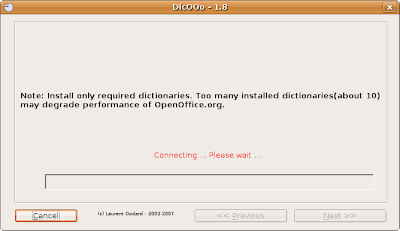 Click Next Once again for it to finally install the selected dictionaries. 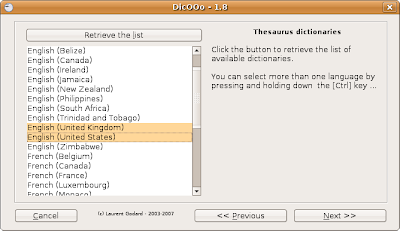 That is possibly all you need to do to setup your dictionaries. Now go to the Open Office Menu, “Tools> Options”, Expand the “Language Settings” Section, select “Languages” and set “Default Language for Documents: Western” to English (USA) or English (UK). 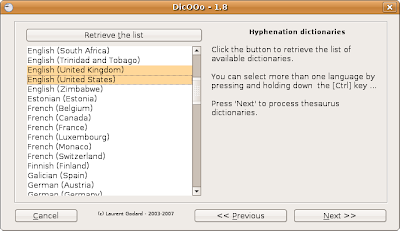 When you select a language, if it has a tick mark with ‘ABC’ written to the left of the name of the language, the Dictionary for that language is installed. English(India) apparently doesn’t have a dictionary that can be downloaded yet. However on my installation, I got an unknown command error. A bit of digging showed that there was no object called postgresql in the /etc/init.d directory. A quick ls at /etc/init.d showed that the link was actually postgresql-8.2. So if the previous command to start the server does not work, a bit of digging around would help to find the correct name. Or of course, you could just restart the damn box. The server is now installed and started. We now have to create a user who can create a database. Or as postgresql is fond of saying, we need to define a role. You will be prompted for a password and then to reenter the password. This command in effect tells postgresql to create a user of name ‘graydot’ with database creation permissions (-d), no super-user permissions (-D) and no permission to add roles (-R). The characters in small case for these option allot permissions and the capitals disable them. You should replace ‘graydot’ with your account user name. You are now in your user profile. We now intend to create a database. The createdb command is used to create a new database in postgresql. A new database of the name test_db is now created with the owner set to the currently logged in user. Open the SQL prompt with the psql command. At the sql prompt, type 'l' to see a list of databases and their owners. These are the basics of installing postgresql in the simplest way possible, upto the step of creating a database. I will be posting more as time permits. This will go up as a tutorial on my website when I finally get around to bringing it up. I recently looked up a few videos by Randy Pausch, one was his ‘last lecture‘ and the other was on time management. The former was on Youtube and the other was on Google Videos. The Youtube video was easy to download with youtube-dl on my Linux Mint Distro, (for how to do this, look up this simple tutorial) but I was stuck on the Google Video. Google Video apparently doesn’t have any download link and is not popular enough for developer to have tools designed for it yet. I tried ‘Flash Video Resources Downloader’ firefox extension, but it open up a website which says that the flv file is not accessible. I finally had to give up on that and begin some frantic googling. Jason Striegel at hackszine has made a cool script which seems to work excellent. I have the video downloading in the background at present. The file is 171 mb and the download speed is only like 15 kBps, so it is gonna take some time. On a side note, the file downloaded will be ‘get-video.flv’ at your default download location or wherever you ask it to download. I can foresee some problems with multiple video downloads in some situations, but firefox just appends a (#) at the end of the video so generally it should not be a problem.